Wow, 6 months at Patrick Baudisch's new Lab at the Hasso-Plattner-Institut in Potsdam, Germany. 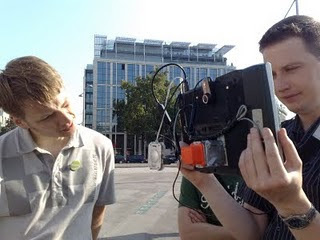 Patrick is one of the few rock stars in HCI and especially research on touch and multi touch interaction. His brainstorming sessions are legendary (and I can't wait to see the sniff-o-meter in action). 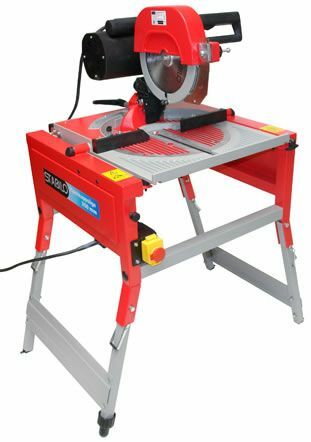 By the time he bought this saw I knew he was serious about building the new Luminos (get the CHI paper here). Did I mention that the saw moved into the women's loo? It was a brilliant time at Patrick's lab and I think it was the most intense learning experience I've had in a while. My project with him was focussed around sound based overview techniques for object detection and metaphors to improve distance perception with sound. A publication is in preparation! 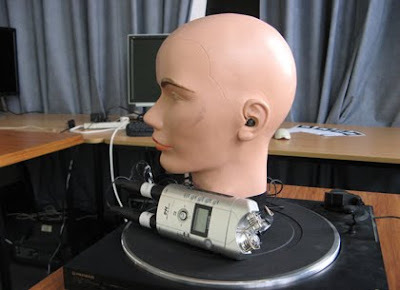 In collaboration with Nokia Research we investigated if spatial sound causes effects of simulator sickness (or motion sickness (there is a lengthy discussion about whether simulator sickness is a form of motion sickness. Therefore we will refer to what made people sick during our experiments as "simulator sickness")). We started off with a recording made with an improvised binaural recording device (the head) mounted on a manipulated record player that allowed seamless speed manipulation. We compared the binaural recording to a stereo recording (made with a Zoom H4) and found it worth to take a closer look at. Click "read more" to listen to some sound demos. 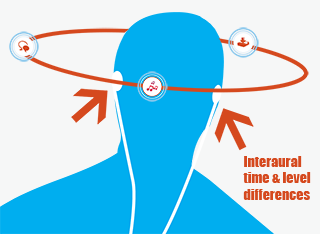 Mobile Auditory User Interfaces are an ongoing research project. The general aim is to design and build an interface that has almost the same capabilities as a visual interface but only relies on (spatial) sound. The prototype we built uses fmod (in the first version) and OpenAL (in the second version) to position sound items on a horizontal plane around the user (who is wearing headphones). 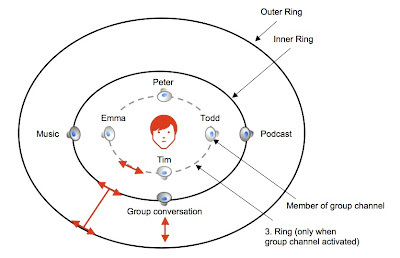 As the figure below shows the interface consists of two virtual "rings" around the users head on which auditory representations of items or streams are positioned. 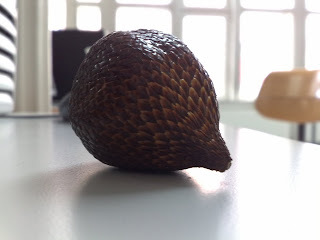 Click "read more" to see some interactive flash demos. 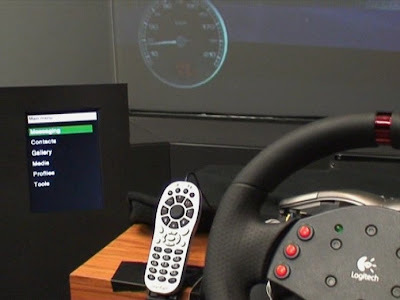 We looked at how an in-Vehicle Auditory User Interface can improve the safety of drivers. Therefore we built a very simple graphical interface and compared it to a spatial auditory interface. They both had the same functionality: the user could navigate a hierarchical mobile phone menu (we used a stripped down menu from the Nokia S60 Series) and access typical items like contacts, music player, text messaging, etc. The visual interface was built to be displayed on on-board screens like being used in navigation systems while the auditory interface was spatially spread out using a 7.1 speaker system (resembling the on-board speaker system). Just participated in the IPCity Summer School in Vienna (September 22-25th) . 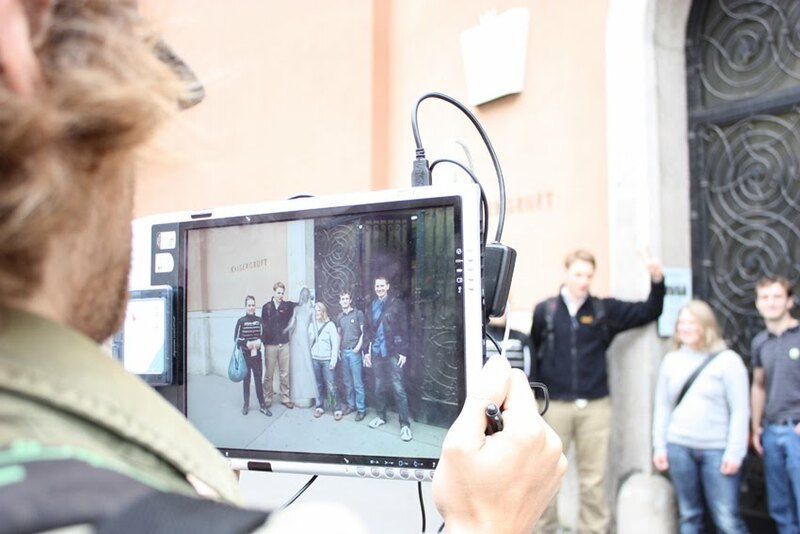 IPCity is a EU funded Sixth Framework programme Integrated project on Interaction and Presence in Urban Environments (http://www.ipcity.eu). We've had lots of fun playing around with the Fraunhofer TimeWarp Tech Framework and we created our own little ghostly tourism app - helping the ghost of Sisi to retrieve her lost juwels (which are, of course, hidden all over Vienna).